Provides a 40% wider angle of view than on the standard JVC GY-HD100/110 16x lens. Fits directly onto any lens with a 82mm filter thread including the 16x lens for the JVC GY-HD100/110. Ideal for use when the very widest end of the zoom range is not needed, but when full zoom-through capability all the way to the telephoto end of the zoom range is necessary. 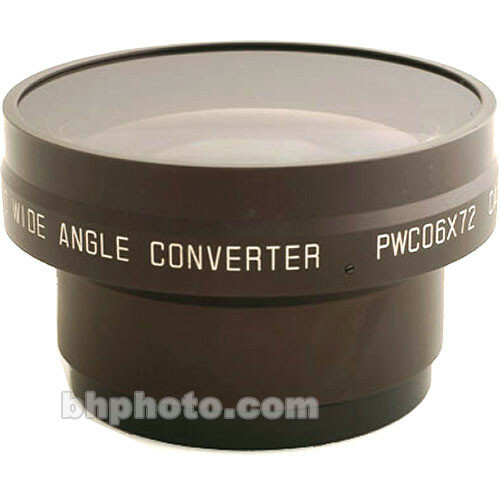 Dimensions (LxDiameter) 3.9 x 0.9"
Box Dimensions (LxWxH) 5.4 x 5.3 x 4.7"
PWC06X72JHD100 0.6x Industrial Wide Angle Converter is rated 1.0 out of 5 by 1. Rated 1 out of 5 by Dave from This lens is horrible I chose this lens because of the wide angle it offered. However, it is definitely NOT the solution. I've owned and worked with wide angle adaptors from Century and others through the years, and by comparison, this lens is horrible! Ghost images, light rings in any and all lighting conditions make it completely unusable. Thought I'd save a few bucks by buying something cheaper. Learned my lesson. Don't waste your money on this lens.